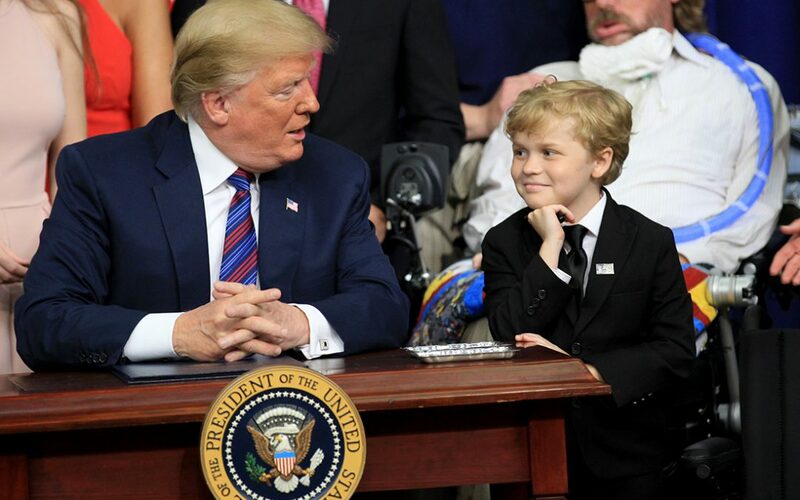 WASHINGTON — President Donald Trump told 8-year-old Indianapolis native Jordan McLinn on Wednesday that he has the look of a president before signing a bill that McLinn and his family have championed to allow terminally ill people to receive experimental treatments. 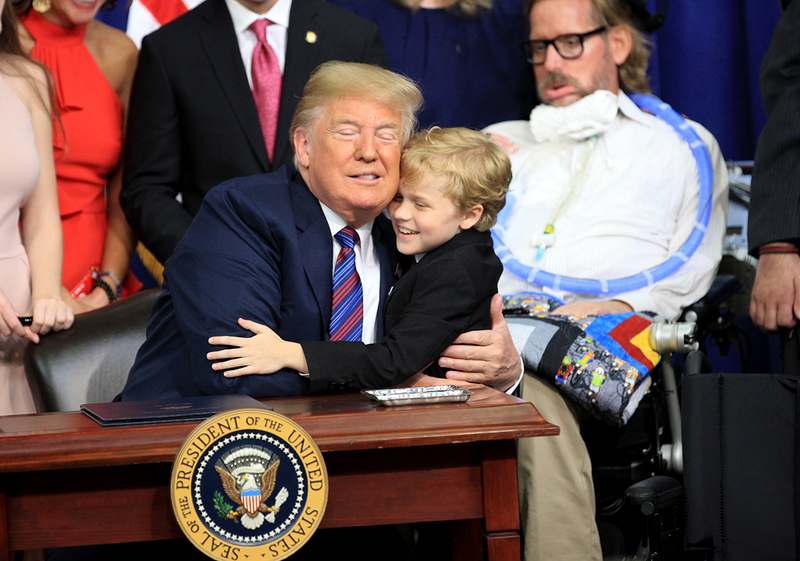 Trump gave McLinn a pen, hug and kiss during the White House ceremony — but more important to McLinn was the bill Trump signed into law allowing terminally ill patients to use experimental medicines that have not yet been approved by the Food and Drug Administration after all other treatments have failed. The youngster has Duchenne muscular dystrophy, which weakens muscles and is fatal. The act gives “new hope to vulnerable families all across America,” said Vice President Mike Pence before introducing the president. 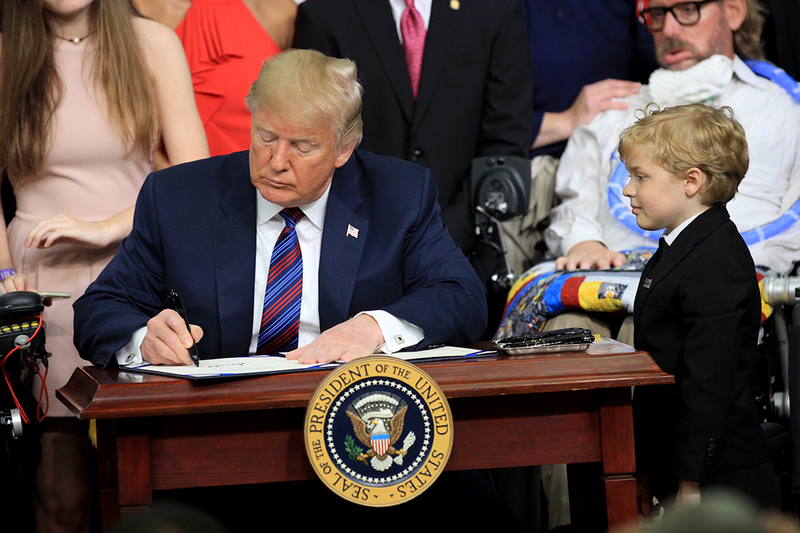 Trump personally thanked Democrat Sen. Joe Donnelly for being the primary co-sponsor on the Right to Try legislation, during the bill signing Wednesday. That comment was an abrupt shift from his earlier criticisms of Donnelly, considered to be one of the most vulnerable Democrats in the Senate, as he runs for re-election for a seat in a red state that definitively voted for Trump in 2016. Earlier this month during a campaign rally in Elkhart, Ind., Trump attacked Donnelly for voting with the “radical left of Nancy Pelosi” and labeled him as ineffective. On Wednesday, Trump quickly thanked the senator. Pence also praised Congress for working in a bipartisan manner. “This is how Congress should work to advance the interests of the American people,” Pence said. He also called McLinn one of his heroes. McLinn, in a black suit and tie, stood beside Trump as the president signed the bill. 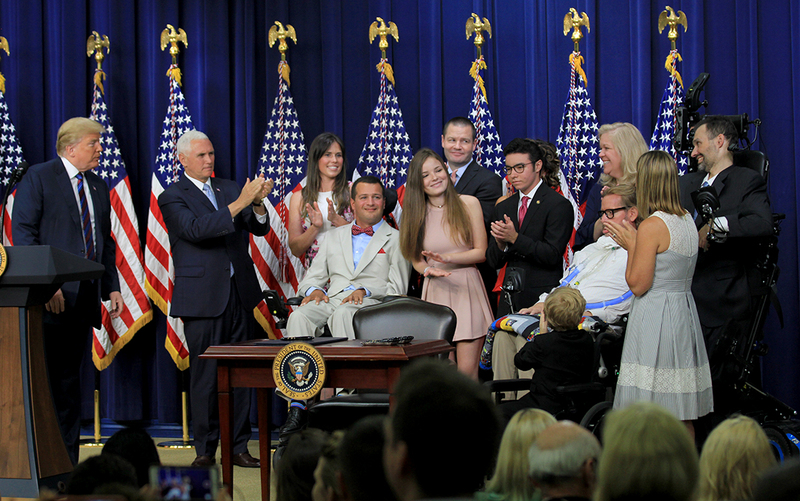 Other supporters of the bill on stage included many who have amyotrophic lateral sclerosis, more commonly known as ALS, or have a family member suffering from the illness. “You have extraordinary courage, determination and love. You have love. Real love. And thanks to you, countless American lives will ultimately be saved,” Trump said. 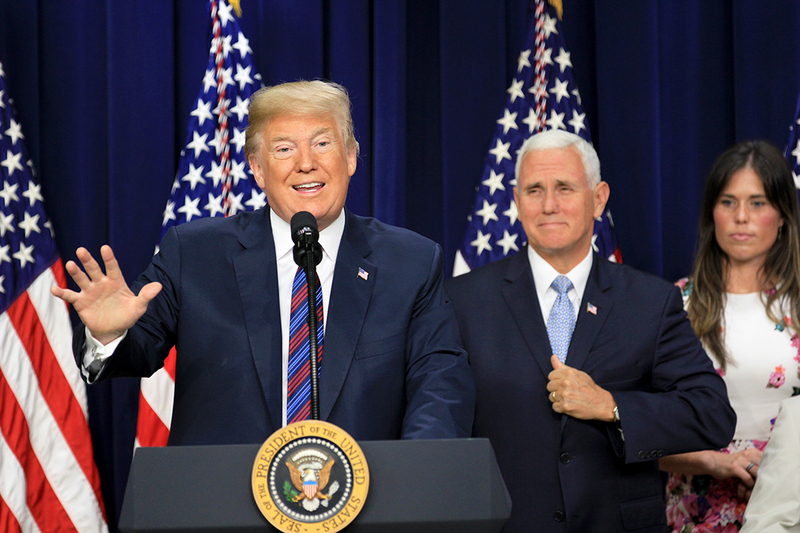 Patients will have access to “promising” experimental life-saving treatments that they couldn’t get before due to red tape by pharmaceutical and insurance companies as well as liability issues, Trump said. More than 40 states, including Indiana, have passed measures that allow terminally ill patients to try experimental treatments that have not been approved by FDA. However, because the FDA is a federal agency, those measures have been blocked on a nationwide scale. “We stand ready to implement this legislation in a way that achieves Congress’ intent to promote access and protect patients. The FDA is dedicated to achieving the goals that Congress set forth in this legislation, so that patients facing terminal conditions have an additional avenue to access promising investigational medicines,” the FDA said in a statement released Wednesday. IndyStar reporter Kaitlin Lange contributed to this story.